ALTHOUGH many people have heard of Slovenia, few can point it out on a map and even fewer can name the capital. This lack of knowledge is precisely what makes Slovenia such a great place to visit. John Bailey returns from Slovenia with a tale of success. Oh my God. We’re driving manically through the Slovenia forest in the freezing darkness, jeep slithering down the track like a drunken snake. I’m on the back seat, trying to sort out cameras and flashguns and to settle my beating heart. Deer scatter in front of the headlights. I glimpse a boar in a clearing. The wilderness is everywhere … fitting home to perhaps the rarest fly-catchable target in the northern hemisphere. Hucho hucho. The huchen. The Danubian salmon. Call it what you will – we’ve caught one. It’s taken me sixteen years of continuous trips to focus my lens on a huchen but now, at last, I know I’m so close. 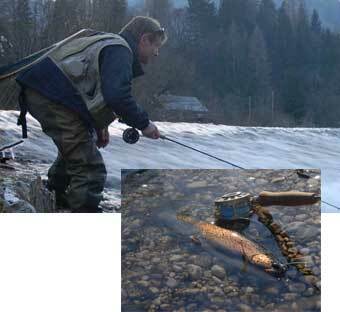 I’m praying the fish isn’t dead, or returned, or tiny … I couldn’t stand another knock back after all these years. We’re here. The river bank is a madness of activity. Al, the captor, the hero, looks like a man possessed. So he should be. Roc. Marco. Robin. All headless chickens. It’s chaos. And there, tethered in the shallow backwater is THE fish. Twenty odd pounds of huchen. A glorious slab of silver in the torchlight. Just over a metre. The inhabitant of a tiny alpine-like river smaller than the Itchen. It’s a miracle of a monster from what’s little more than a stream. As I focus, I scrutinise the fish and calm down. There’s a job to be done. Blimey. I’m taking it all in. Fishery science is bunkum half the time. 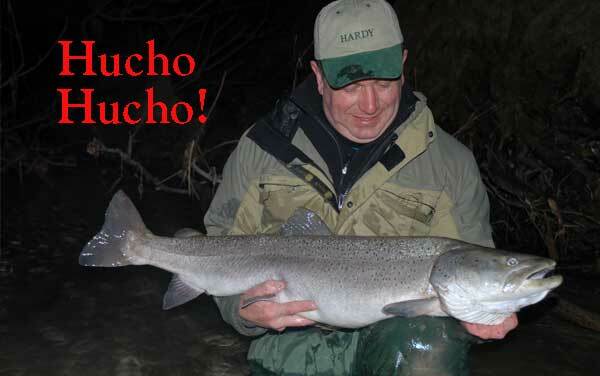 Central Europe – hucho hucho – the huchen. Asia – hucho hucho taimen – the taimen. Blood brothers we’re told, peas in a pod. But they couldn’t be more different. The huchen and the taimen. There’s no red tail here. Nothing of that pike-like shovel head. Silver flanks not purple blue. The adipose fin is about all that unites them. You must drink in these photographs. They’re rare as a fish that talks. And remember where that fish has just come from…a transparent river laughing its way through forests and Tyrolean-like meadows. A land (today) of peace and plenty. Snow-capped mountains towering over all. Big grayling. Wild rainbows and browns. All fodder for these mighty huchen. Fish you can sight and stalk. Fish you creep up on until they’re a rod’s length off. Fish that take flies mimicking bullheads, lampreys and immature grayling. Fish that are massive and gorgeous and to die for. Well done Al. Well done guides. Sixteen years of waiting done with. Oh my God? Thank you Lord for this star-filled night.